Shiitake Mushrooms (3/4) - Remove stems and discard, then slice into 1/4" slices. Jalapeno (1) - Cut into 1/2, discard seeds, stem and white-ribbing, then mince. Red Bell Pepper (1) - Cut into 1/2, discard seed pod and stem, then slice into 1/4" strips. Broccoli, florets (1 1/2 cups) - Roughly chop broccoli into bite-sized pieces. Lime (1) - Cut into half, then slice 1/2 into quarters for garnish saving other 1/2 for juicing. Sprouted Tofu (1/2 block) - Slice sprouted tofu into bite-sized cubes. Cilantro (10 sprigs) - Destem and discard stems, then roughly chop cilantro leaves. Scallion (2) - Cut root ends off and discard ends, then thinly slice scallion at an angle. To large pot add carrots, mushrooms and desired amount of jalapeño (or omit). Cook 3 minutes, stirring periodically. Add bell pepper and broccoli to pot with carrots and mushrooms; stir. Add green curry paste to pot. Squeeze juice of the half lime over pot. Add lite coconut milk and 1/2 can of water to pot, stir. Reduce large pot heat to medium. Cook 6-8 minutes, stirring periodically. Reduce large pot heat to low. Bring medium pot to a boil. Add ramen to boiling water. Stir to ramen to separate. Strain ramen & return to medium pot. Drizzle ramen with 1 tablespoon toasted sesame seed oil. 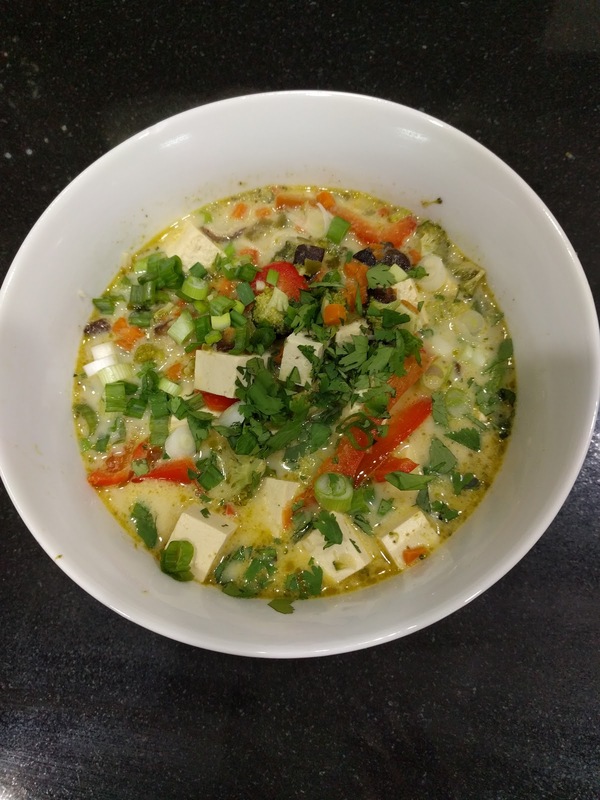 Ladle tom kha over noodles. Sprinkle cilantro and scallions, divided evenly, over top of each bowl.